How do I know if God is calling me to a Short-Term Missions Trip? Talk to God about it! If you feel a missions trip is becoming more of a possibility, you should pray about it alone and with close friends (your small group or family). Share your fears and anxieties with those who have been on a short term trip or schedule a time to meet with our Missions Pastor. Invite a friend or family member to go with you. And step out in faith! Each team will have four-six meetings prior to the trip, at least one meeting after the trip and a follow-up meeting two months after a trip. The preparation required is spiritually, culturally and specific to the mission. Fundraising is part of the experience and it is recommended that at least 20 letters be sent to family and friends for financial and prayer support. 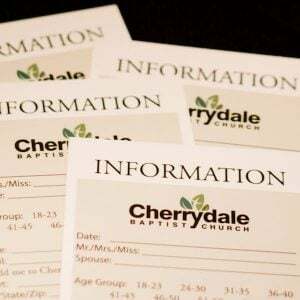 You are also expected to be at Cherrydale Baptist Church (CBC) for six months after the trip to share your insights/experience with the church and to serve either in the church or in the community. May I drink alcohol or smoke on the trip? No. Remember that you are going as a missionary and what you do and do not do counts as much as what you say. Most cultures do not expect Christians to drink alcohol or smoke. Can my girlfriend/boyfriend come too? Yes, you can come and serve together, it may deepen your relationship, but you will not be able to sleep in the same room and should not be spending time alone often. Most cultures are far less accepting of public displays of affection, so you will need to keep this in mind. Most of the time, married couples will be paired up in ministry and accommodation. Can I travel without my spouse? Yes, but this may not be the best. The nature of as missions trips is such that we encourage all married couples to consider trips together. It is a disadvantage for one spouse not to experience the thrill and growth of a trip, so we encourage both to participate. Is there anything that will “disqualify” me from applying? If you have recently become a Christian, you should investigate carefully before committing yourself to a trip. Also, if you have major health problems, you should consult your doctor before applying. A servant spirit is needed for a successful trip and if you can’t be flexible or teachable, then you won’t enjoy the experience. I want to go, but can’t commit time for the preparation. What do I do? Can I still go? The time for preparing is as important as the mission trip itself, and if your schedule will not allow you to join the meetings, you should wait a year until you can make room in your schedule for it. Most team leaders would allow for a member to miss one meeting but generally not more than that. How are missions trips funded at CBC? Individuals are expected to raise a majority of their financial support. Individuals are expected to pay a $100 registration/application fee (applied to the trip) and then write a least 20 letters to family and friends to raise prayer and financial support. 25% of an individual’s total budgeted trip cost, up to a maximum of $700, is available for CBC members and children who have been actively involved in CBC for 6 months prior to trip departure. This support will be provided prior to trip departure, if funds are needed. 15% of an individual’s total budgeted trip cost is available for regular attendees (non-members who have been actively involved in CBC for 6 months prior to trip departure. This support will be provided prior to the trip, if funds are needed. If an individual who is going on a CBC-sponsored trip receives over 100% of his/her total budgeted cost, the surplus will be applied to his/her team’s ministry. Individuals who do not attend CBC are eligible for trip participation, but are not eligible for CBC financial support. Remaining costs are the responsibility of the participant. Why should I raise support if I can self-fund it? The Christian qualities of humility and allowing others to invest in your trip–trusting God to provide–are all ways that you can grow. If you can self-fund, we advise you to also send 20 letters for prayer support and to help other team members. Those who support you are most eager and excited to hear about your trip once you return. Also, when you let God provide for you, it is always faith-building and illustrative of how He cares for you! Can I participate on a non-Cherrydale sponsored Mission Trip? Yes! We encourage involvement with other mission organizations and God-honoring churches. Individuals who are seeking financial support or commissioning as a church member for participation in another church, ministry or to help a CBC Missionary, must: a) Describe the purpose of the trip; b) Explain whom they are working with and why; c) Share their testimony and why they feel God is calling them to this trip; d) Send prayer letters and raise support; e) Meet with the Mission Pastor; e) Disclose the total costs, and membership status; f) After returning, report to the church what you experienced.